The main issue was that, at 28 years of age, Renee did not want to wear traditional metal braces. So, we considered all options available and after in-depth discussions between Renee and Dr Danylak, we concluded that a treatment plan including both Invisalign Clear Braces and porcelain veneers was the ideal option. All in all, this treatment took 18 months to complete, and today, Renee has the smile of her dreams. Step 1: As with all our treatment plans, the first step was to undertake a thorough review of Renee’s teeth, gums and mouth. This involved x-rays, as well as an examination. 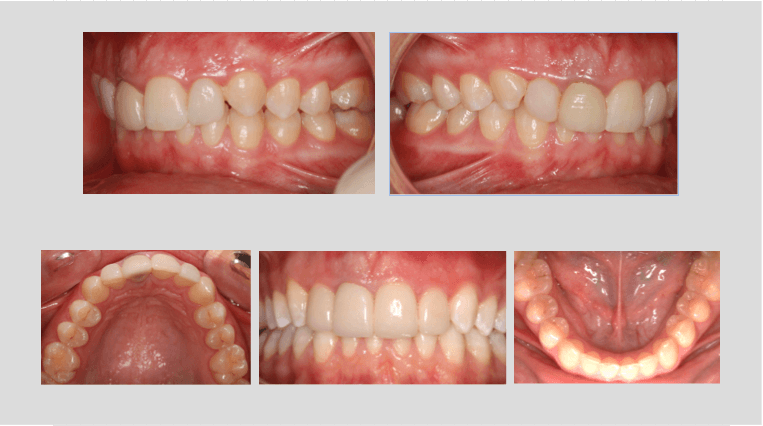 Once this was complete, we discussed the treatment options in detail, before agreeing on a plan that both Renee and Dr Danylak were happy with: Invisalign and porcelain veneers. Step 2: Renee was then fitted for her Invisalign aligners. These (almost invisible) aligners are worn for two-week periods, before being swapped out for the next aligner in the series. An aligner works by slowly moving your teeth into the correct occlusion, much like traditional braces. Step 3: Over the course of 18 months, Renee visited Dr Danylak on multiple occasions, to refine the Invisalign treatment. Whilst in the chair, Renee also had teeth whitening performed, and Dr Danylak prepared her teeth for porcelain veneers. Step 4: Once Renee’s Invisalign treatment was complete, we fitted the porcelain veneers to the surface of her teeth.